HUM 311 "New Media," a course taught this past term by Sharla Sava, adjunct assistant professor in the Faculty of Humanities and Social Sciences, became something of a social media experiment itself. Not only did it bring students of all three schools together, it tasked them to collaborate on developing social media applications and even invited tweeting during class. At the end of the course team members presented their collaborative project before a panel comprised of faculty and outside experts. As a result, one project will likely be rolled out for use by the Cooper student body, perhaps as early as next semester. 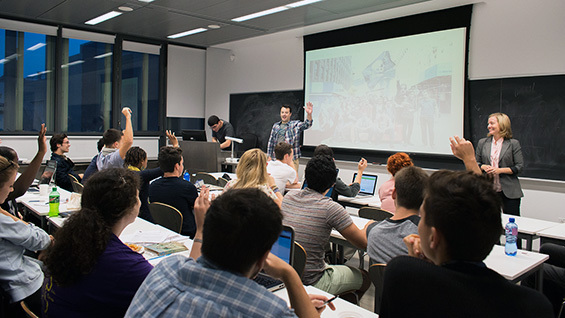 "It seemed to me that the informal communication channels used by the students are something we should bring into the classroom," Prof. Sava, who developed the class and is the Associate Director of the Center for Writing, says. "I wanted to allow the kind of intellectual curiosity and analysis that takes place inside the classroom to shed light on what happens just outside the classroom. I think there are a lot of opportunities for us to study and make sense of communication as it is shaped through social media channels." Though originally conceived as a traditional, theory-based, media studies class, Prof. Sava had an epiphany. "I realized that because Cooper Union students are makers and creators, regardless of their school; they would connect a lot more deeply with the ideas if I structured the class around some sort of production. 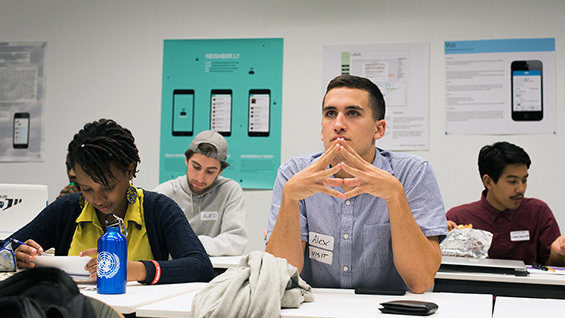 I asked the students to be makers, users, and critics of social media." During the first few weeks the 21 students were asked to brainstorm and come up with an idea for a social-media-driven solution to a societal problem, and then pitch their concept to the class as a whole. After listening to a pitch, students voted by secret ballot. The top seven concepts went forward, becoming the starting point for seven teams. Every team had members from more than one school, ensuring that artists, architects and engineers would work closely together throughout the course. After forming teams, students began doing intensive background research and drafting a persuasive proposal intended to offer a thorough, well organized argument describing the value of their project in the world today. They also began to explore the technical end of production, including user interface and visual design, through collaborative sketching (both on paper and online). Team projects included: "Neighborly," a sharing service targeted for Brooklyn that lets users borrow and lend items to others in their community; "OurSpace," a community network that allows New Yorkers to list, discover, and book event venues cost-effectively; and "Visit" -- a virtual tourism platform for locals to post unique community-based details about their neighborhoods. At the end of the semester each team presented their prototypes to a guest panel that included Deans Germano and Dahlberg, Andrew Tochilovsky of the Herb Lubalin Center of Design and Typography and two social media industry professionals, among others. But one team focused on a need particular to Cooper Union students, and is already well on its way to becoming a reality. "Cooper Union Info" (yes, they purchased the domain) aims to be a site where students can find facilities information, including hours, location and even physical dimensions for every lab, studio, office and other usable space on campus. "We were trying to make the information accessible to everyone using a simple interface," says Alexa Reghenzani, a fourth-year architecture student, who directed the team. The other founders include Justin Suazo, a senior in the School of Art, and Alejandro Acosta, an electrical engineering junior. "We are utilizing a platform with a 2D map of Cooper Union that you can move through, as well as a search bar similar to Google. So if you need to know what time the library opens you can just start typing, 'What time does the library open?' This will get a result page that not only lists the full schedule of the library; it will highlight the current day as well as give you a phone number and such." They want to build in a system for socially driven real-time updating of hours as well. "For example if Alejandro, who works in the computer center, decides to stay late and keep it open, he can update its closing time on the Cooper Union Info site," Alexa says. "So people can say, 'Oh look, the computer center is open late today so I can take advantage of this.' Right now it is very, very difficult to find any information on what is open and when." The team has gotten full support from the IT faculty, who have donated server space and are building a sign-in authentication system based on Cooper email. The team hopes to launch the most basic form of the site (a Google docs spreadsheet) during the winter break. They then want to develop the front end and launch the full version of the site by the end of the spring semester. And then? "We hope to be able to sell this product or method to other schools to gain revenue for student scholarships at Cooper," Alexa says. An example of cross-disciplinary learning at its best, the experimental new media class has resulted in benefits both practical and, in fact, social. "It’s the first time I worked in any significant capacity with members of the other Schools," Alejandro says. "It's been a good experience to have worked with people who think differently than I do. Although it was a bit of a challenge," he laughs. Alexa agrees, saying, "It was a bit of challenge but you learn so much. It was really nice to see the other side of things." Prof. Sava would love for the teams to have more time to launch demo sites and begin usability testing. "It was one the most significant experiences I have had in the classroom," she says. "I am grateful to the students for the commitment they showed -- and their willingness to embrace what was, essentially, a learning process for all of us. And I am genuinely impressed with what they were able to create, given their incredibly hectic -- and often conflicting -- schedules, within the framework of an HSS elective."